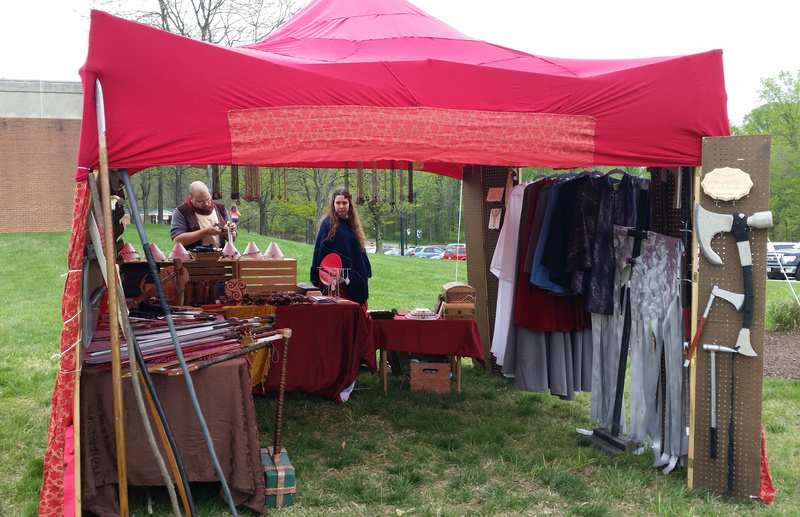 This was the third year of the College of Southern Maryland Renaissance Festival, and our second year as vendors. It’s a tiny show, but we love it. 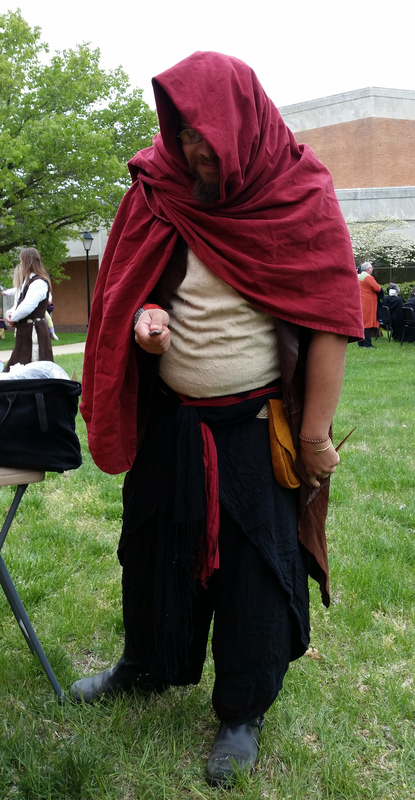 This faire is thrown by the theater department of the College of Southern Maryland, on the front lawn of their performing arts building. Each year the faire centers around multiple performances of a period appropriate play – this year, it was Midsummer Night’s Dream. Nathaniel the corsair threatens to stab me with a tiny knife, while wishing he had waited a week to shave his hair off. Cold! We showed up on a cold Saturday, threatening rain. A boon for my cloak sales, but not all that fun to sit in. Still, people were out and about, having fun. The local chapter of the SCA joined in this year, teaching, giving demos, and otherwise adding to the faire feel with their presence. Everything felt just a little more renaissance and festive this year. Probably the last show for the patchwork red tent – but we’re still sticking with red! And first show for awesome helper Gwen. Our booth was first in the row, just across from the SCA and in front of the outdoor stage. Which mean we have a great view of the highlights – magic show and Queen Elizabeth are awesome – and lowlights – ouch to blocking with your face, fighting demonstrator – of the faire. And we are right there, bantering with guests and doing our best to the festive air. This show, tiny as it is and as early as it is, is also a bit of a test market for us. We touch base with friends from the Virginia Renaissance Festival, bring out new items we’ve been making, and encourage people to come to the bigger faires later in the year. It’s free to attend, so next year, take a look for our big red tent and see what’s new!